A rod is a symbol of authority in many cultures. Jewish tradition tells of staves endowed with miraculous powers. In the Bible, the staff of Aaron was transformed into a serpent and was the instrument for summoning the first three plagues against Egypt (Ex. 7:17; 8:5; 8:16-17; 9:23; 10:13). Aaron’s rod, however, also delivered signs when not in his hands, as when it budded and blossomed overnight as part of a trial by ordeal (Num. 17:8-10). Moses also possessed a rod (Ex.4:20) he used in performing miraculous deeds (Ex. 14:16; 17:9, Num. 20:11). This rod, created on the eve of the sixth day (Avot 5.6), was made of either sapphire or almond wood and bore an inscription of the Tetragrammaton as well as an acrostic phrase constructed from the initials for the Ten Plagues (Mid. Teh. 9:1; Pes. 54a). It radiated light from the divine name (Zohar I:9a). Like Excalibur, only the rightful owner could withdraw the rod once it was planted in the ground. Created at twilight, before the Sabbath, it was given to Adam in the Garden of Eden. Adam gave it to Enoch, who gave it to Methuselah; he in turn passed it on to Noah. Noah bequeathed it to his son Shem, who transmitted it to Abraham. From Abraham to Isaac, and then to Jacob, who took it with him to Egypt. Jacob gave it to Joseph; upon Joseph's death all his possessions were removed to Pharaoh's place. Jethro one of Pharaoh's advisers desired it, whereupon he took it and stuck it in the ground in his garden in Midian. From then on no one could pull out the staff until Moses came. He read the Hebrew on the staff, and pulled it out readily. Knowing then that Moses was the redeemer of Israel, Jethro gave him his daughter Zepporah in marriage." (Pirkei de Rabbi Eliezer 40). ”The Lord will give Hephzibah, the mother of Menachem son of Amiel, a staff for acts of salvation,” he said, “A great star will shine before her. All the stars will swerve from their paths.” Hephzibah, the mother of Menachem son of Amiel, will go out and kill two kings whose hearts are set on doing evil: Nof, king of Yemen….Iszinan, king of Antioch….Now the staff that the Lord will give Hephzibah, the mother of the Menachem son of Amiel, is made of almond wood, and it is hidden away in Rakkath…This is the staff the Lord gave Adam and Moses, and Aaron and Joshua and King David…. 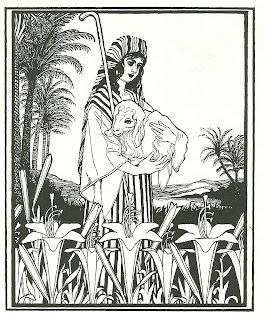 Hephzibah, the mother of Menachem son of Amiel, will stand at the east gate [of Jerusalem during the eschatological crisis] so that wicked men will not come there….Then Hephzibah, the mother of the Messiah, will come and hand over to him the staff by which the signs were performed (Sefer Zerubbabel, as translated in Rabbinic Fantasies). It then passes from her to the Messiah ben Joseph and then to the Messiah ben David, who will wield it in end-times struggles (Sefer Zerubbabel; PdRE 40; Yalkut Ps. 110 # 869; Buber Tan., Yaeira 8). But even out of reach, this awesome rod has power to help Jews in distress. Several Hebrew and Aramaic amulets from Late Antiquity and the Middle Ages invoke the authority of Aaron's rod in granting protection to the bearer (Naveh and Shaked, Magic Spells and Formulae). Christianity developed additional magical traditions about this legendary staff (Heb. 9:4), regarding it to be a relic from the Tree of Life and linking it closely to various Biblical figures and finally to Jesus, for whom the staff served as the cross beam of his crucifix (Origen; Book of the Bee).